Crime • Agency links note-passing man to nine other heists. 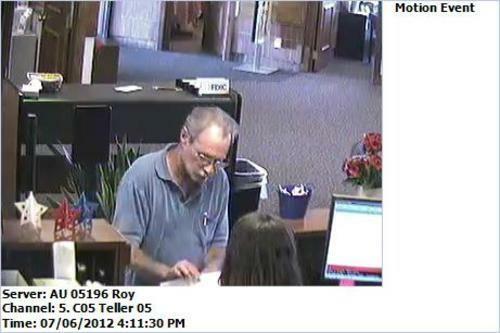 Courtesy photo Roy police are looking for a man who walked into the Wells Fargo Bank in Roy located at 5600 S. 1900 West at 4:30 p.m. on July 6 and handed the teller a threatening note indicating that he had four months to live and needed money. 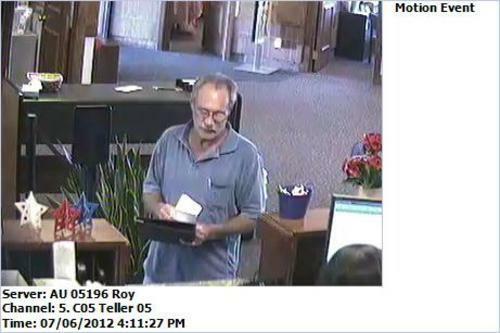 Courtesy photo Roy police are looking for a man who walked into the Wells Fargo Bank in Roy located at 5600 S. 1900 West at 4:30 p.m. on July 6 and handed the teller a threatening note indicating that he had four months to live and needed money. 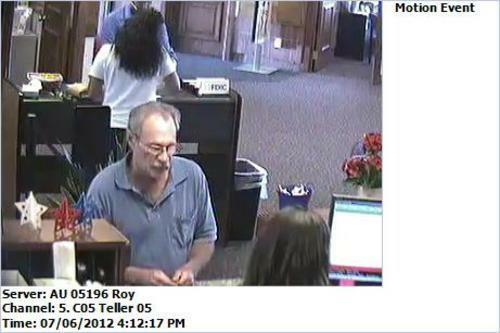 Courtesy photo Roy police are looking for a man who walked into the Wells Fargo Bank in Roy located at 5600 S. 1900 West at 4:30 p.m. on July 6 and handed the teller a threatening note indicating that he had four months to live and needed money. 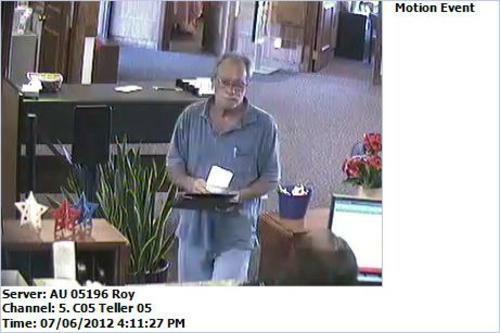 Courtesy photo Roy police are looking for a man who walked into the Wells Fargo Bank in Roy located at 5600 S. 1900 West at 4:30 p.m. on July 6 and handed the teller a threatening note indicating that he had four months to live and needed money. 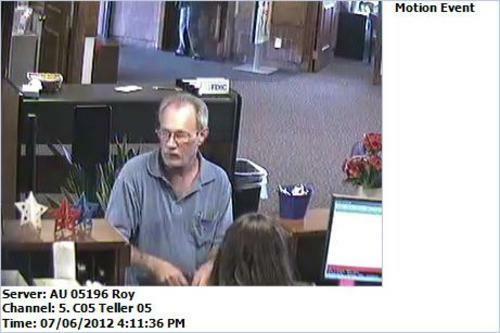 Courtesy photo Roy police are looking for a man who walked into the Wells Fargo Bank in Roy located at 5600 S. 1900 West at 4:30 p.m. on July 6 and handed the teller a threatening note indicating that he had four months to live and needed money. The FBI is hunting for a serial bank robber suspected in heists in eight states and whom the agency dubbed the "Bucket List Bandit" after he passed a note to a Utah teller claiming he had only months to live. The agency suspects the same paunchy man with thinning gray hair and a beard is responsible for nine robberies since June  the most recent two late last month in Columbia, Mo., and the St. Louis suburb of O'Fallon. The man, aged 55 to 60, is also suspected in robberies in Utah, Colorado, Arizona, Idaho, North Carolina, Tennessee and Illinois. The man is suspected of robbing a bank in Pocatello, Idaho, July 6, then later that same day in Roy, Utah, about two hours' drive away. It was during the Utah heist that he earned his nickname, passing a note to the teller announcing the robbery and offering an explanation for the crime. "He told the teller, 'I have four months to live,' " said Rebecca Wu of the FBI's St. Louis office. Roy Police Sgt. Danny Hammon said the specific wording of the note wasn't known because the bandit took it back. It wasn't clear if the bandit wanted the money for medical care or for spending money during the course of his final few months of life. No one has been hurt in the robberies, and officials aren't saying how much money he's gotten away with. The robber has implied he had a weapon in some of the crimes but has never shown one. He was seen with a black compact sport utility vehicle, with a silver rack on top, after robberies in Winston-Salem, N.C., and Bloomington, Ill. Authorities are also searching for that vehicle. The FBI will use digital billboards in the eight states where the bandit has struck to display images of the man in hopes of tracking him down, Wu said. Serial bank robbers are not uncommon, but Wu said they generally strike within a regional area. There are exceptions. Last year, a man dubbed the "Granddad Bandit" was sentenced to 25 years in prison for robbing 26 banks in 14 states. Michael Francis Mara, graying and balding, earned the nickname for his grandfatherly appearance. And, in fact, he is a grandfather. Wu said Mara was caught after someone recognized him from a digital billboard.